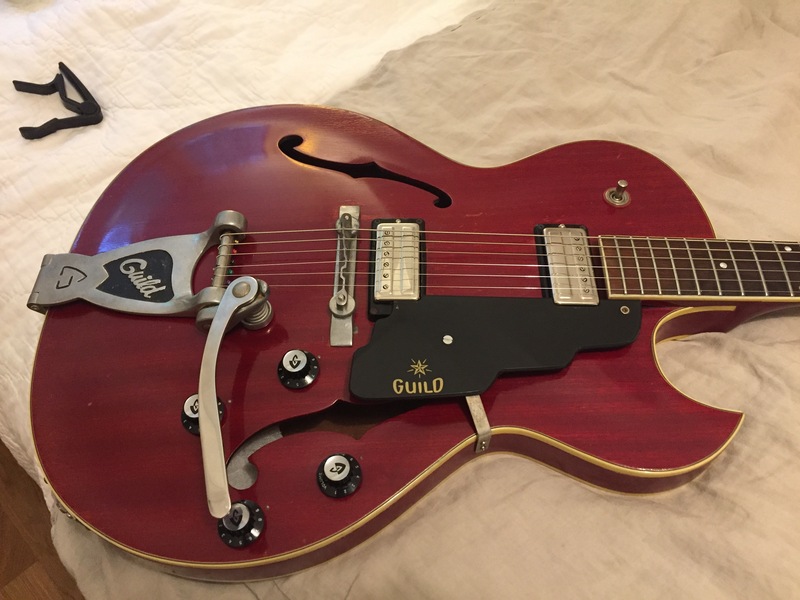 Not a 335 but a Guild Starfire V from the late 60’s. I don’t generally buy these but I should. I really like vintage guitars but you already knew that. I’m aware that this blog can look pretty elitist-I’m talking about guitars that cost $10,000 to over $100,000 and I don’t talk much about the really affordable stuff that has all the vintage vibe of a 59 335 and none of the sticker shock. In fact, it goes beyond the “vibe” and into playability and tone. There are guitars that are extremely well made and can be incredible players. These guitars are generally not on the serious collectors radar but should be on the serious player/collector’s radar, especially if you’re young and still making your way in whatever career you’ve chosen for yourself. And I’m not just talking to millennials. I’m talking to old guys like me who really love old guitars but don’t want or don’t have the means to drop $10K or more on a guitar. I have one word for you. Guild. When I was a teenager in the mid 60’s, Guilds were part of what we might call “the big four” of electric guitars. Lots of kids played Hagstroms, Teiscos, Kays and Harmonys but those of us who had a gigging band (or rich parents) played Fenders, Gibsons, Gretsches and Guilds. There were other good, though less common, American electrics-Rickenbackers, Mosrites (I played a 64 in the early 70’s), Epiphones (I played a 61 Wilshire in the late 60’s) and maybe Standels (I owned one in 68) but they were outliers due to rarity and perhaps cost (Mosrites were really expensive). We know the virtues of Fenders and Gibsons and the good stuff is pricey. Gretsches can be hit and miss (in my opinion) although I’ve had a couple of really great early 60’s 6120’s, they were not cheap. But Guilds are consistently good and consistently cheap. And why is that? It’s not that rock stars of the era didn’t play them. Jerry Garcia (and Bob Weir) played them, Jack Casady played a Guild bass, Zal Yanovsky of the Lovin’ Spoonful played a Guild Thunderbird which is a very cool guitar. Muddy Waters had one too. Lennon had Guild 12 but he didn’t play it much, apparently. So, that can’t be it. To further that point, George played a Gretsch Gent and they aren’t terribly expensive either, so I don’t think the rock star thing holds much water. So, I don’t really know why Guilds are so cheap. But cheap they are. The Starfire line which is somewhat derivative of Gibsons ES line can be really excellent, although sometimes heavy. 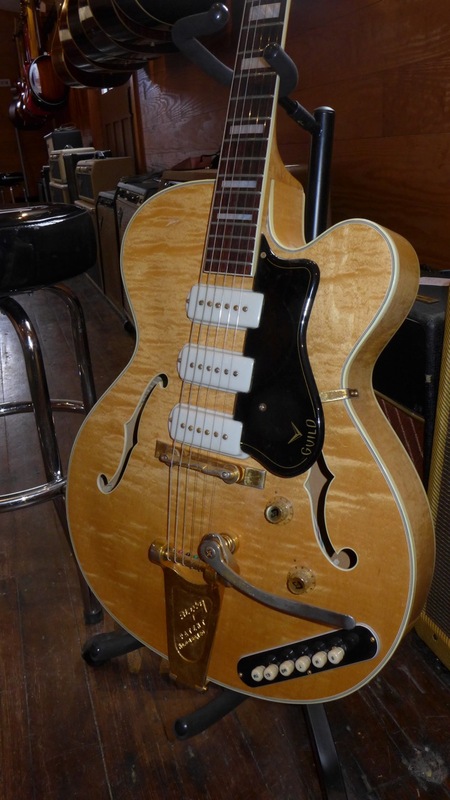 The single cuts with DeArmond pickups, which are pretty great single coils, started in 61 and the double cuts with hum buckers followed a few years later. I’ve seen plenty of 60’s double cut Starfire IV’s, V’s and VI’s for $2000-$3000. These were about the same price as 335, 345 and 355’s back in the 60’s and were considered good alternatives. I think Gibson made the better pickup but the playability is pretty close especially for mid to later 60’s which often have a wider nut than their Gibson counterparts. The early single cuts with DeArmonds cost even less. Then there are the Guild hollow bodies from the fifties and into the 60’s. These are wonderful players and as beautiful as any big Gibson jazz box. Many had pickups made by a company called Franz and they are quite wonderful. Think of it as a P90 with manners. The nastiness of P90’s is legendary but the Franz has a sweeter tone when backed off and plenty of snarl when you cut them loose. I really like the three pickup Guilds (X-375, with the pushbuttons which are simply selectors- not a Varitone). I like the more conventional two pickup X-175 and the CE-100 as well. And cheap? You can score a clean one for a couple of grand. When’s the last time you saw an L5 CES for that? So, if you want to get into vintage for the love of playing and owning old stuff, Guild is a great way to start. I don’t think they are going to appreciate much any time soon but maybe they will if folks start buying them. Not because they are great investments but because they are great guitars. Now back to our regularly scheduled (elitist) programming. I actually own this one. It’s a 60 X-350-I think they called it a Stratford. It’s full hollow and every bit as pretty as anything Gibson made. Those are Franz pickups. I bought a Starfire III a few months ago after seeing Peter Moren (from Peter Bjorn and John) playing one while supporting Robert Forster from the Go-Betweens here in Sweden. It looked and sounded so cool I just had to investigate and found one with replaced repro pickups for just 1200 USD on Reverb !! Cool! I’ve always loved the Starfires but agree with you, they can be heavy. Oh well, take some of the big bucks you saved vs. buying that mint dotneck and join a gym to ramp up your back and arm strength, ha, ha! Any thoughts on 60’s Gretsch guitars like the Viking, Blackhawk, Rally, Country Club,…? All of them have some strange features (tuning key bridge), but are relatively low priced, good playing gateway drugs to vintage guitars. Great column about the under-appreciated vintage Guild guitars. Don’t forget that Epiphones from late 50’s to late 60’s were built in same factory along side Gibsons. They are also Gibsons for the most part. Right, the Kalamazoo-built Epis are fully equal in quality to their Gibson brethren! My ‘62 Riviera is one of my favorite guitars, stickered mini-PAFs, crazy rare, they only built about 40 of them per year for the first two years of issue, 1962-63. The short headstock models are the ones to have though don’t scoff at a nice 1964 or 1965 model! I could easily replace my ‘63 335, not so with the Riv! I love the Franz pickups. There’s an M-75 Aristocrat reissue with new version Franz’s made somewhere in the Orient, I’m sure, that sound real good. Joe, Love the above pictured Guild! Very classy looking sunburst finish. What model and year is it? Chambered body? RAB.It’s a 1955 M75 Aristocrat.Full hollowbody.Spruce top.Light as a feather. A great many of us old guys have the ES-335 VOS–as players, these guitars are very true to the original. Mine is a “63,” and I added a Bigsby (the no-new-holes version). But it’s not a 50 yr old guitar, and these Guilds are, at about the same price. I like some Gretsches but not the Viking and not the Rally. The tuning fork assembly on the Viking (and Falcon) is just about the dumbest thing I’ve ever seen. The Rally build quality is generally poor. I’ve never even seen a Blackhawk. I like the Country Club though especially the late 50’s and especially the Cadillac green ones. I don’t think I’ve played one from the 60’s. That’s just what I’m talking about. Good vintage guitars for cheap. The collection I just inspected has a lot of single cut Starfires-mostly with DeArmonds rather than hum buckers. Green ones, too. If any one is looking for a particular model Guild let me know. I’m not buying the collection but I will have access to the guitars as consignments. Guilds are definitely good guitars with consistent quality and solid playability. Remember their knock off of the Gibson SG? Those particular guitars had high output versions of the Guild HB. Though I’m not familiar with each model name/designation, they had a range of medium, better, and premium quality full hollow bodies. 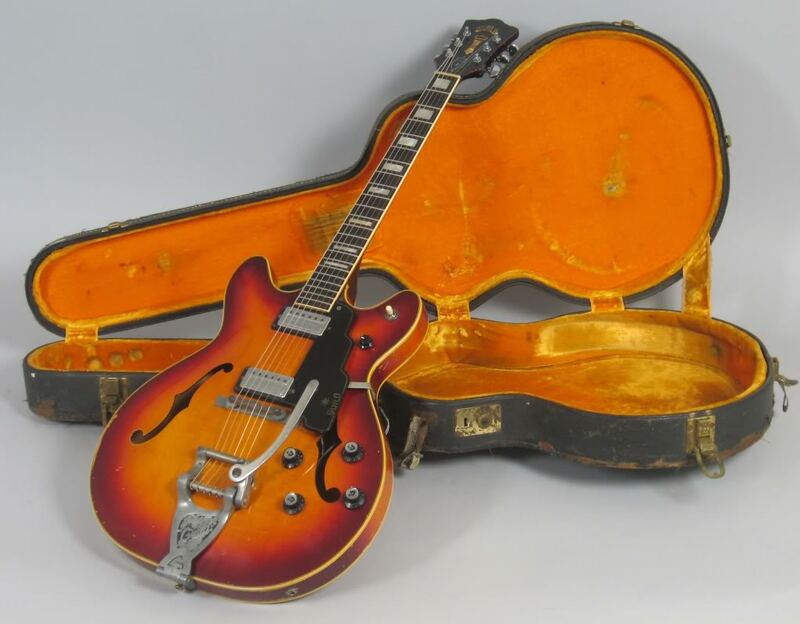 And for the high end jazz guys, don’t forget the rare, expensive and super high quality, carved top Guild Artist Award, as famously played by George Benson in his pre-Ibanez signature endorsement days. So glad you published this column! Yes some of the Guilds are terrific guitars and a great value. My first good electric was a mid 60s M-75 like Joe C.’s pictured in this thread – last of the single coil ones before they brought it back around ’68-69 with humbuckers as the BluesBird. I think some of the B-list guitars from the 60s were unpopular because amp choices were more limited –especially in the pre-master-volume era — and they just didn’t “crank” through a Fender or Marshall like solid and semi solid Gibsons and Fender guitars did. Yes Epis can be great values. 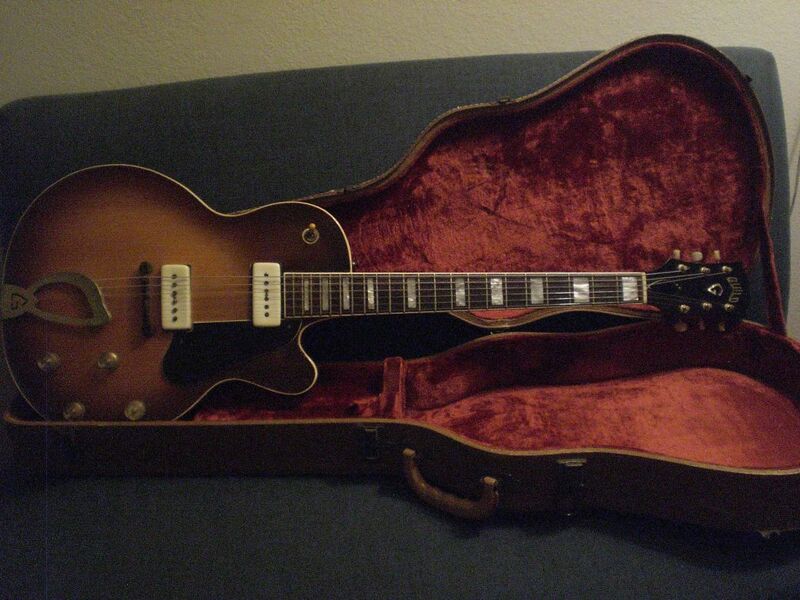 The Epiphone Broadway is a good alternative to an ES-175 (early 60s have the nickle mini-PAFs — mmm-mm-good). The Sorrento is like an ES-125TD but with mini-hums. And the Epi Coronet with one P-90 and a wraparound bridge is a terrific cross between a late 50s Les Paul Jr and early 60s SG Jr – they’re typically well under $3K. One grail find – though kinda pricey — is the early 60s Epi Wilshire with P-90s: like an SG special. But the non-trem models (if unmolested) have a nickel ABR-1 bridge AND a nickel stop tail piece. In fact, it may be the only ’60s Gibson with this nickel tailpiece combo other than the ES-335 — and the only P90 stop tail guitar since the ’56 Les Paul gold top. Wow.